It’s fall and outer coast beach hoppers rejoice. 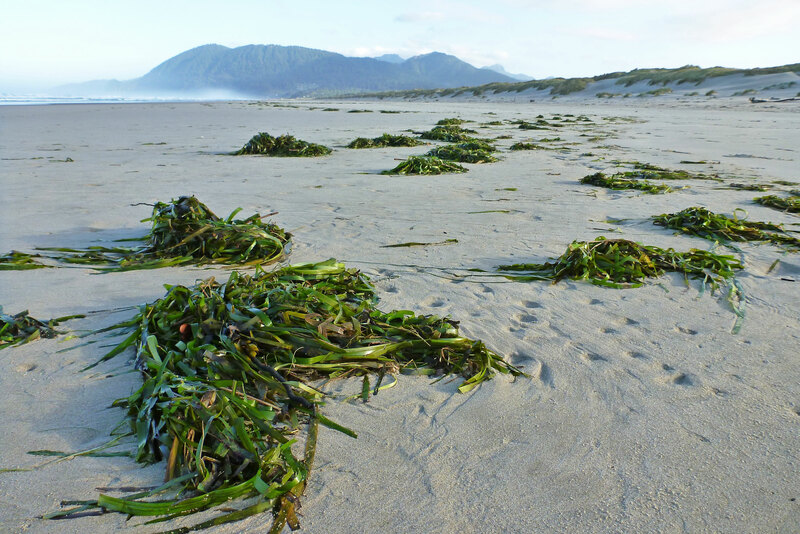 Algal drift washes ashore and hoppers are abundant and active in the drift line. There is a lot of hopper activity on, around, and under all the wave-deposited treasures. 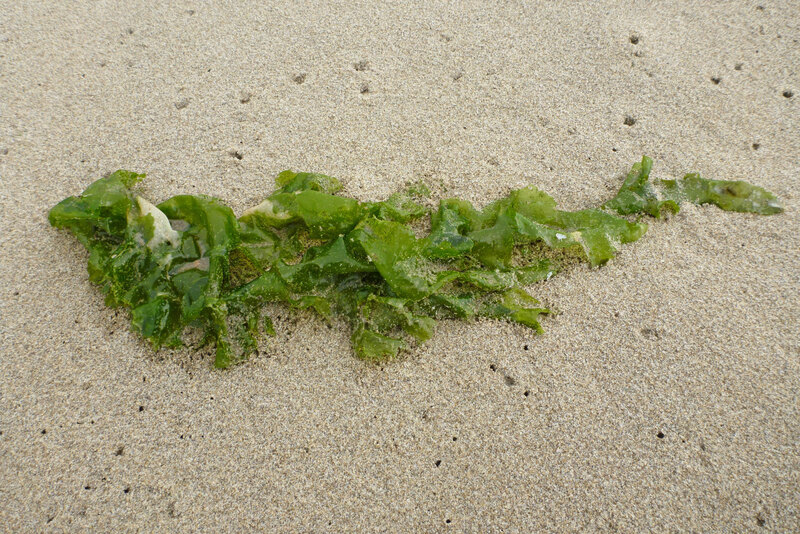 You can see abundant shows around this sea lettuce, and even more under the edges. Beach hoppers aren’t too picky it seems. Terrestrial plants like tobacco attract hoppers too. 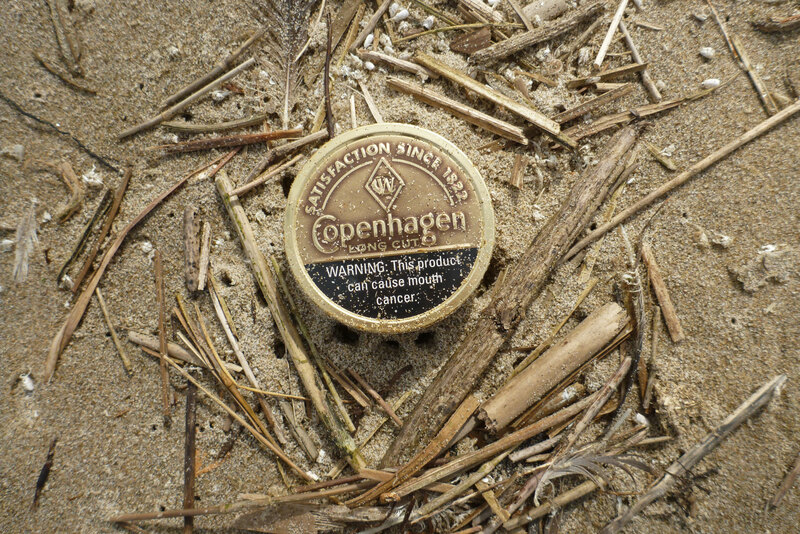 Fresh shows mark the sand all around the edge of the snuff tin. Animal food also attracts hoppers. Beach hoppers like their protein. Small drift line carcasses like this unfortunate polychaete, Nephtys, don’t last long. 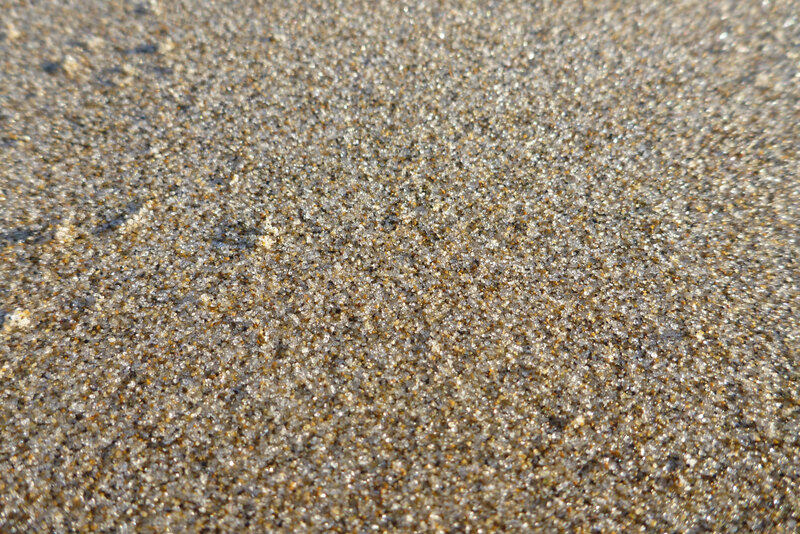 A beach cast of Zostera brings out the beach hoppers. Early morning is a good time to see them out and about, celebrating. 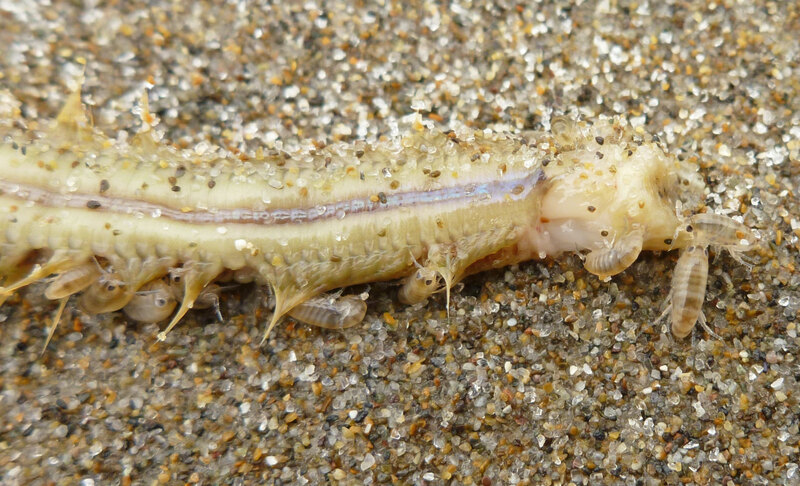 These images show the pale beach hopper, Megalorchestia columbiana. At least I think they’re M. columbiana. While I was trying to learn more about beach hoppers, Ricketts and Calvin kind of shook my confidence. That may be true, but I’m betting the little hoppers I’m talking about here are M. columbiana. If you’re looking for an enjoyable activity, try spending a morning photographing beach hoppers. They are easy to locate and abundant in the drift line’s early morning light, but photographing them requires patience. Most of my attempts looked like this. It leapt right out of the frame, dang it! They scurry this way and that, mostly away from you, and when you finally get one in focus, they are just as likely as not to spring away…like a flea. 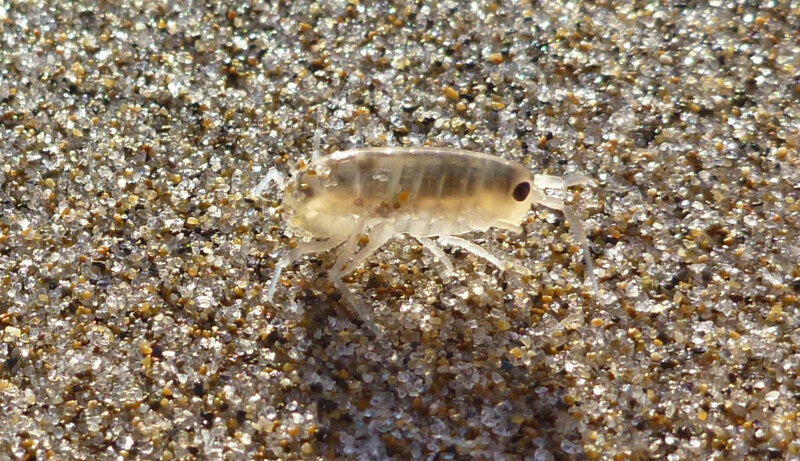 But don’t call them beach fleas. Ricketts and Calvin explain it like no one else. 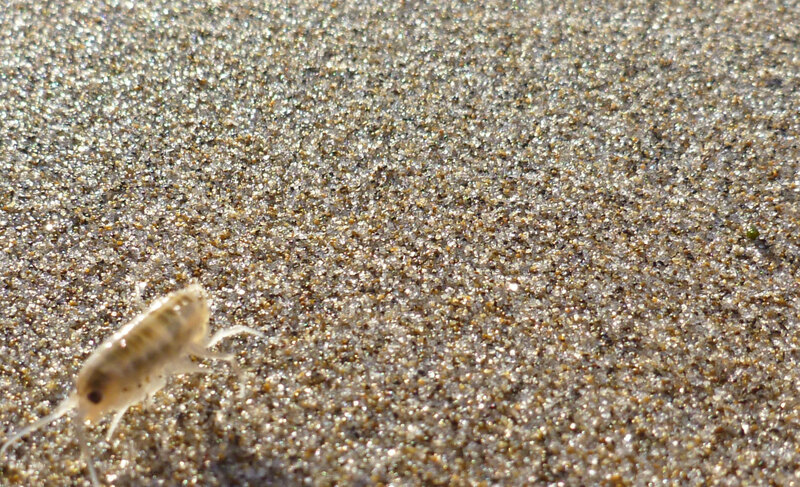 It should be mentioned in extenuation of the hoppers that their variant name “beach flea” is a libelous misnomer. I found that you can track a single individual until it tires and sits still for a photo. This takes a lot of concentration and patience. To get the photos I used in this post my attention was so directed at the hoppers that I twice took a soaking in the chilly swash. With only a few more or less faint markings on the dorsum, you can see why people call them pale beach hoppers. At 2 cm and smaller, they can be abundant, and in this part of the world, most people’s first encounter with beach hoppers is with the pale beach hopper. But they aren’t the only hopper on the beach. 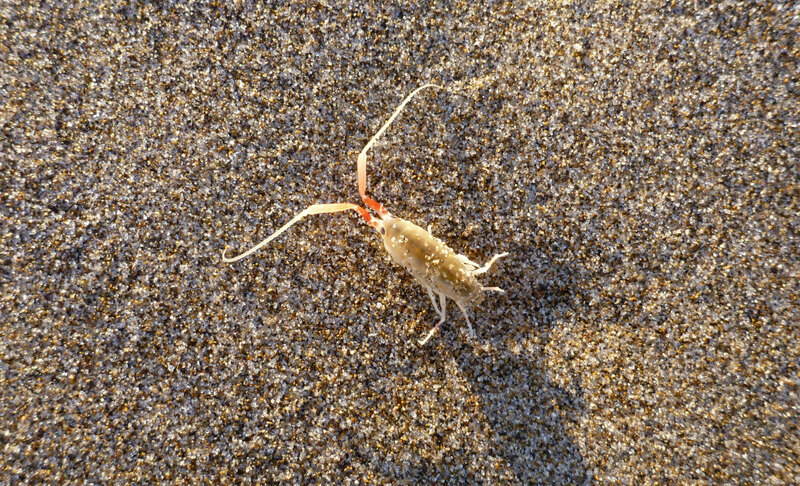 Megalorchestia columbiana shares exposed outer coast beaches with its congener, M. californiana, a bigger, red-antennaed version called the California or long-horned beach hopper. Ricketts, E. W., and J. Calvin. 1968. Between Pacific Tides. 4th ed., revised by J. W. Hedgpeth. Stanford University Press. Love the photos. Appreciate your patience in getting up close to capture one. They’re so elusive! Thanks. Without specimens and a dissecting scope, photos are about the only way to appreciate the hoppers close up. I wasn’t going to collect any, so I’m glad I took the time. I now have a much more informed impression. Thank you, I had fun taking the photos and thinking about the lives of those little hoppers. I see these guys quite often. It took me awhile to figure out what all the movement was. They sure move fast. I’m thinking I may have some shots of them. I didn’t have the patience to tire and track them, but managed with sheer luck. If you find those beach hopper shots, maybe a hopper post is in order. I’d love to see what you came up with.